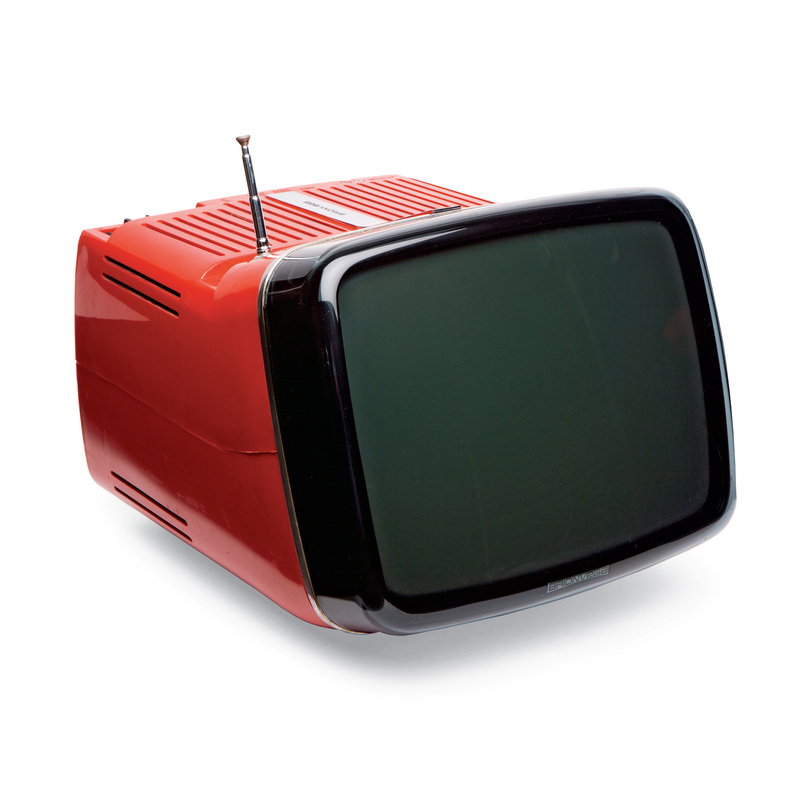 Unlike prior TVs, this bright plastic model from 1964, equipped with a collapsible metal handle, didn’t feature a wooden frame. Marco Zanuso and Richard Sapper developed it for Brionvega, relying on miniaturized circuitry to achieve its compact size. Wells Coates designed the AD65 radio, shown here in a rare green version, for British electronics company Ekco in 1932. New technology made this wireless device possible, but it was the visual shift from wood cabinetry-like casing that made the piece stand out. Italian architect Mario Bellini led electronics company Olivetti’s design division from 1963 to 1991, producing calculators, typewriters, and personal computers. He invented a tapered profile to reduce the heft of this machine, designed between 1985 and 1986. This portable tape player and recorder by William Lansing Plum for Sharp, released in 1985, also played AM/FM radio. The colorful pastel shell and control buttons nodded to an emerging—and enduring—trend: electronics as personal fashion accessory. As electronics became increasingly integrated into the modern household, the design of devices became more important than before. These items were celebrated for their appearance, as plastic, sometimes brightly colored, became a standard material. Philanthropist George R. Kravis II collected modern consumer products throughout his career as a radio broadcasting executive. He has since expanded his trove into an extensive selection of industrial design, the highlights of which are presented in 100 Designs for a Modern World (Skira Rizzoli). Introduced by historian Penny Sparke, the book provides a visual timeline of many of the most significant—and delightful—unions of technology and design from the past century.